Brian Joubert of France leads the Men's Short Program at the 2009 World Figure Skating Championships after his skate to Rise by Safri Duo. There is something in the air in Los Angeles. Or maybe it’s in the water. Either way, figure skating has never looked so good. After great competitions yesterday, the men took to the ice at the Staples Center, and followed up those performances with some great ones of their own. A little more than four points separates the top four competitors which sets the stage for a dramatic freeskate that could be one of the most talked about events in recent years. Leading the pack is Brian Joubert of France, the 2007 World Champion, who skated an audience-pleasing program to Rise by Safri Duo. Joubert opened with a hand down on his quadruple toe loop attempt, but was able to tack on a triple toe loop on the end, albeit with a step out. The reigning European Champion was exact on all of his other elements, earning high levels and grades of execution (GOE) to propel him into the lead. His total score of 84.40 points gave him a 1.70 points lead heading into the freeskate. Sitting in second place is USA’s Evan Lysacek, skating in his adopted hometown and in front of a huge crowd of supporters. Lysacek showed a much more relaxed, yet somehow more intense program, to Ravel’s Bolero, and got through each technical element without error. Along with his triple Lutz-triple toe loop combination, Lysacek’s triple Axel was rewarded with a positive GOE, for which the Four Continents silver medalist was excited. The U.S. bronze medalist earned a total of 82.70 points in the short program, and leads Canadian Patrick Chan by 0.15 points heading into the freeskate. Skating to Vanessa Mae’s rendition of Tango de los Exilados, Chan also performed each of his elements cleanly, but was unable to perform with his usual flair. Chan’s triple Axel, however, was scored as the best in the competition. The Canadian Champion has become embroiled in a war of words of late with the leader over the importance of a quadruple jump in a program. However, in this competition, Chan was more concerned about the component scores than the quadruple jump. Chan sits in third place with a total of 82.55 points, and is close enough to Joubert to make it a really interesting event tomorrow in the free skate. In fourth place is the Czech Republic’s Tomas Verner, the 2008 European Champion. After opening with a gorgeous quadruple toe loop-triple toe loop, Verner messed up the landing on his triple Axel, which cost him the lead. 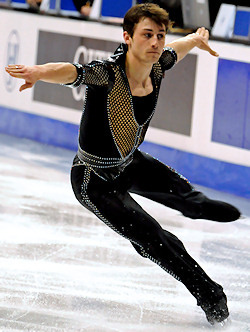 Verner was in fourth place after last year’s short program as well, but he had a disastrous performance in the freeskate and plummeted to 15th place overall. This season has been one of ups and downs for Verner, who finally qualified this season for his first Grand Prix Final where he placed fourth. Here in Los Angeles, Verner has a renewed focus, but has been trying to overcome his mental block with the rink itself. Verner earned 80.36 points for his efforts, just a hair more than Takahiko Kozuka of Japan’s 79.35 points. Kozuka is making a case for himself to be considered among the few elite at the top of men’s skating. Skating to a sleek and sassy program to Dave Brubeck’s Take Five, the Grand Prix Final silver medalist skated perhaps the most sedate performance of the competition. Everything seemed so polished and easy for the athlete. Kozuka was competitive with the top men from a technical standpoint, but received lower program component scores that kept him out of the top three. Should the top men falter, the 20-year-old could play the role of spoiler and skate away with a medal. In sixth place is Italy’s Samuel Contesti. After a four-year absence from international championships, the recently crowned European silver medalist is making quite the splash. Contesti did just that in his routine to J’envoie valser and Valse des monsters, commanding the ice with interesting choreography and competent technical elements including a gorgeous triple Lutz-triple toe loop combination. Due to Contesti’s lack of international experience, however, the Italian champ was seeded far lower than his skating would indicate, and his new personal best score of 78.50 points held up some 22 skaters later in the evening. Finishing in seventh place is Japan’s Nobunari Oda, who is making his celebrated return to the World Championships after a missing last season due to personal reasons. The 22-year-old opened his program with a nice triple Axel, but ran out of room on his triple Lutz-triple toe loop combination and landed into the boards. Skating to Khatchaturian’s Masquerade Waltz, Oda performed the rest of his program with poise and flair, and earned 76.49 points for his efforts. Just behind Oda is U.S. silver medalist Brandon Mroz, who skated to Richard Strauss’ Till Eulenspiegel’s Merry Pranks. The 18-year-old is making his World Championships debut, and did himself proud with a solid and clean performance. Mroz showed that his nationals performance was not a fluke – , earning a career best of 76.49 points with a performance marred only by a minor issue with his solo triple flip jump. However, his triple Axel and triple Lutz-triple toe loop combination were exquisite, and his total element score was actually higher than Oda’s. In ninth place is Russia’s Sergei Voronov, who opened with a slight miscue on the back half of his quadruple toe loop-triple toe loop combination. The Russian champ was clean on his other two jumps, but he could earn only a level two for both of his step sequences. Still, his score of 72.15 is a new personal best, and he hopes for some Hollywood magic heading into the freeskate. Finishing in a disappointing 10th place is U.S. Champion Jeremy Abbott, who perpetuated his reputation as a head case by missing two key elements in his short program. Fortunately, Abbott has a lot of experience to draw from in coming from behind, but his short program score of 72.15 points will make it difficult for the 23-year-old to move into medal position.